Join us at Medidata NEXT London April 25-26. An ever increasing abundance of data sources are pushing the limits of how trials are designed, conducted, and closed out. These data sources no longer come only from sites and labs. They are now complemented by data coming from patients directly (in the form of apps and sensors), medical images, genomics, and more. The second challenge is directly related to the first: a scarcity of patients. Paradoxically, as an abundance of available data sources makes targeted therapy and precision medicine approaches possible, it proportionately shrinks the available pool of patients for a given treatment. This brings us to our third major theme in clinical development: clinical complexity. Ingesting, integrating, standardizing, cleaning, coding, and analyzing all of these disparate data sources creates complexity. Next consider how trials must adapt to a new world of patient scarcity. This creates down stream complexity across a host of areas as well. The evidence bears this out. As we mentioned in a previous post, study complexity has been increasing consistently over the past several years. A recent analysis published in Nature Reviews Drug Discovery explains this trend. We analyzed, from Medidata’s PICAS database, 9,737 clinical trial protocols that received ethics review board approval between 2001-2005 and 2011-2015 and assessed those studies across phases of research. The results are compelling—the number of total procedures performed increased substantially for each phase: 53%, 67%, and 70% more procedures were performed for Phase I protocols, Phase II protocols, and Phase III protocols, respectively. 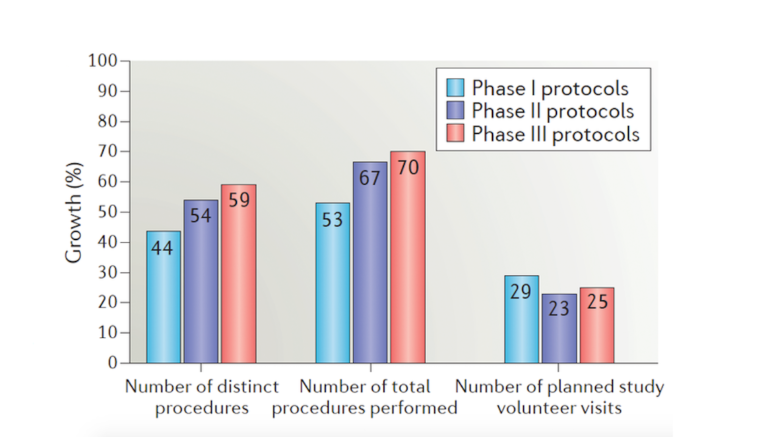 Similar increases in the number of distinct procedures and the number of planned study volunteer visits for Phase I to Phase III trials are shown in the figure above. Over the next few days, we'll investigate how complexity is increasing across most dimensions of trial planning and management.